Saturn's moon Janus obscures part of the planet's A ring as the Cassini spacecraft looks toward the main rings and the thin F ring. Janus (179 kilometers, or 111 miles across) appears as a dark oval to the left of the center of the image. 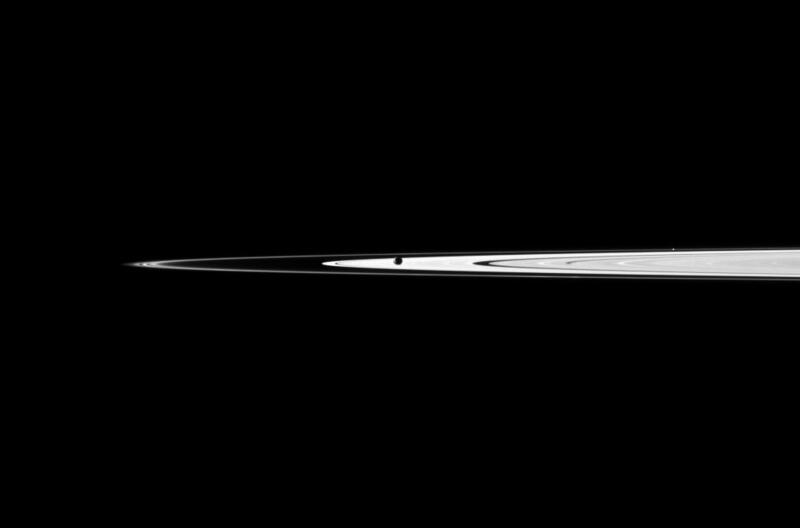 A star can also be seen on the right of the image, beyond the thin F ring. The image was taken in visible light with the Cassini spacecraft narrow-angle camera on Jan. 21, 2011. The view was acquired at a distance of approximately 2.6 million kilometers (1.6 million miles) from Janus. Image scale is 15 kilometers (9 miles) per pixel.